Posted byKartik Subramaniam December 5, 2009 May 7, 2015 Posted inSoftwares 1 Comment on Smart Tips on MS Excel 2007 – How to use Subtotal function? Microsoft Excel has numerous functions but the issue is about knowing which function to use in the shortest time We began with a few smart tips in the initial posts which looked aspects like shortcuts and basic functions in at Microsoft Excel 2007. We would continue with the same and gradually address some more text, math and functions related to editing with examples. In this post we shall look how to use Subtotal function. 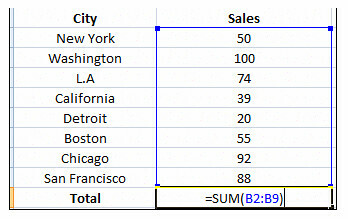 Let’s say you have a set of numeric data like sales in a set of cities. You wish to find out the sum of the units sold. Normally, you might make a selection and click on sigma symbol. This is a time taking process particularly when there are many entries. So, the other way around is to type the sum formula for the selection in the following manner. Now, to get the sum for the same set of values using Subtotal function, you would have to type the function in the following manner. The format for using the function is =Subtotal(function_num, ref1, [ref2]…). For the above example, the function took the following values= Subtotal(9,b2:b9). So, 9 means sum. 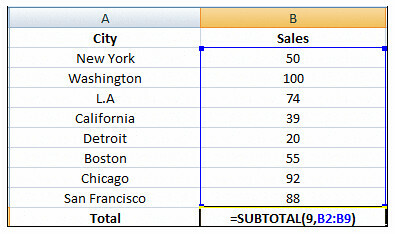 In earlier version of MS Excel, one might have had to remember what each value stood for but in Excel 2007, these values appear once the formula name Subtotal is entered. We would continue bringing out such utility functions to unravel the power of MS Excel. Good one mate.. MS Excel is v powerful. I got to know its potential when I realized you could actually write SQL queries on data in an Excel sheet right in the MS Excel software. Amazing!